DAVAO CITY — Perjury is a serious crime. Duterte was asked in an ambush interview here for his comment on Edgar Matobato’s claims in a Senate hearing. “Alam mo kung bakit, if you know it’s a lie and you have a person who testify, you are an active participant. Sige, sige mag-testify ka, that is subornation of evidence. It’s a serious crime,” he told reporters. Matobato was presented in a Senate hearing by Sen. Leila de Lima, one Duterte’s staunchest critics. 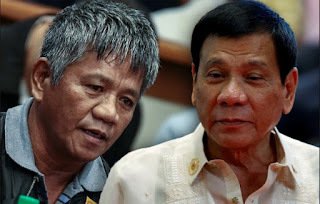 The President also said that his son, Vice Mayor Paolo Duterte, was angry that Matobato implicated him in the alleged extrajudicial killings in Davao City. The self-confessed hitman said Paolo was behind the killing of Cebu businessman Richard King and four security personnel of Duterte’s one time political rival, former Speaker Prospero Nograles. But amid the Senate investigation into extrajudicial killings, Duterte said he would not intervene in matters not within his territory. This came after De Lima lost her Senate chairmanship of the committee on justice. The President said he was not cowed by various investigations meant to discredit his crackdown on illegal drugs. “[The war on] drugs it will continue, I don’t care if there is a thousand hearings everywhere. Maka-focus lang ako doon sa problema,” he said. He said he was focus on his agenda, adding that Congress has its own plan. “Congress, bahala sila magka-gulo dun, I will stick to my own agenda. Congress they have their own show. Go ahead, be my guest,” he said.